How Do I Market and Sell My House (or unit, land, acreage…), then arrange contracts and legals, AND Not Pay Commission? To be perfectly honest, this is one of the simplest parts of the sale process – by ensuring you seek and engage legal advice from the get go. Before you actually place your property ‘on the market’ we strongly advise that you seek the services of a reputable settlement agent, conveyancer or solicitor to assist in the preparation of a contract and any legal documents (e.g. Title searches, Disclosures, Statement of Information…depending on the State your property is in), so you are ready to go when you come to an agreement with your buyer. Once you have secured a deal with your buyer, forward all the details to your legal practitioner so they can create and execute a contract of sale, and help you see the sale through to completion (settlement). You can visit our State Resources page which is a guide to property legislation in each State and Territory. Remember, you are fully within your legal rights to sell your own home and a reputable legal practitioner will guide you through all the legal steps when you accept an offer from a buyer . Pricing, Presenting and Promoting your home; then Qualifying, Engaging and Negotiating with Buyers. The marketing and sale of almost any home is easy and rewarding when you have Agent in a Box by your side, because… we ARE qualified and highly experienced agents ready and able to assist you in moving onto the next phase of your life. This is the disrupter that will scare the real estate industry! Service is brilliant, tutorials/videos spot on and I saved $16,000 in commission. My house sold at the end of the first open for inspection of $10,000 more than the highest expected price. As my conveyancer said “if you are switched on, this is the way to sell your home” . First time ever, we finally had a great experience selling a property. Absolutely no pressure from rude agents. Craig really is a great guy to deal with and very helpful. This is definitely the way to go when selling a property. The first three phases are as equally critical to a successful sale as each other. However pricing can be the single biggest influencer or inhibitor to a sale. Put the wrong price on your home or property (over-price it) and the whole process could be long and frustrating, and that’s whether you sell your own home or hire an agent. List down the main features of your property. Compare them to the main features of similar properties that have sold in the last six months within 1-5 kilometres of your property (look further in rural and acreage areas). We provide a comparative market analysis to our Ultimate members which will help with this. List down the top 4-6 ‘comparables’ to your property and come up with a range that reflects those sale prices. For more certainty, hire the services of a Certified Practicing Valuer. They are independent and impartial. Poorly presented properties repel buyers quicker than you can say ‘For Sale’. Buyers won’t overlook mess or maintenance issues. The Golden Rule of Real Estate sales applies here: “Buyers follow properties, not agents”. The people you see looking in the windows of real estate agencies are usually waiting for their spring rolls and stir fry to cook up two doors down! Today, around 95% of property buyers’ searches and research are carried out online. If your home or property is not listed on a major websites, such as realestate.com.au, or domain.com.au, then you may as well not be on the market – No-one can see you! Join and Create your listing with Agent in a Box; write an informative, brief description about your property, upload the photos (also floor plans if you have them), submit and…..BINGO! Buyers from all over the WORLD can see your home. Also, you may decide to place a classified ad in the local paper. This is recommended if you want to run an Open for Inspection. Agents DO NOT control ALL the buyers. Buyers will find your property! And when they do, ALL their enquires will come to you. When you list your home or property for sale with Agent in a Box, it is on the market until sold, on our partner websites (or until withdrawn by you). Once a buyer makes contact with you or vice versa, talking to them and listening to their requirements is easy. You are helping them to decide whether or not your home or property suits their needs and budget. Also you are getting an idea of whether or not they are actually capable of making a property purchase. This is commonly called ‘Qualification’. It is easy once you know how. Buyers will enquire either by direct phone call or by email. Or they may just turn up at your Open For Inspection, should you decide to run one. We capture ALL email and phone enquiries for you and pass them on almost immediately so you can talk to your prospective buyer and make arrangements for an inspection or you can answer any initial questions they may have. This is all about conducting inspections, whether by appointment or by running an Open For Inspection. Rule #1 of conducting inspections – Don’t follow the buyers around your home like a panting puppy, talking non-stop about your blue carpet or lattice work where the passionfruit vine is growing. LET THEM LOOK and answer any questions they may have. AND most importantly… observe from a distance and listen! We provide easy to follow and comprehensive instruction on talking to and engaging buyers in our video and instructional material on our website via The Tool Box. This invaluable resource has helped hundreds of home and property owners put together fantastic deals! This is what we like to call the ‘Sharp End’. This is where the other five phases come together and lead you to the moment where a buyers says, “What will you take for it?” or “I would like to make an offer.” What you say next to either of these questions/statements can determine how good a deal you put together. The biggest factor to observe is – don’t get emotional or ‘insulted’ by the offer you hear from any buyer. Why? Emotion and Pride are the two biggest killers of deals known to humankind! Always aim for a win-win scenario. These are always the best deals. Fielding an offer from a buyer may seem daunting to some. If that is the case, contact us for timely and proven advice, when a buyer steps forward. We also provide easy to follow negotiation tips in our video and instructional material in ‘The Tool Box’… and we are only a phone call away. So there you have it. Not as complicated as you thought? SIX simple phases or steps to SOLD! 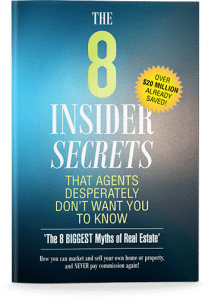 Download our FREE comprehensive guide on selling your own property – The 8 Biggest Myths of Real Estate – the stuff that traditional agents don’t want you to know! Buyers are waiting – Sell your home online now! We are human. And we know you are too. Agent in a Box is all about providing real human interaction and experiences. To ensure you and all our members are receiving an outstanding marketing, sales, knowledge and support service, we are constantly monitoring, upgrading and tweaking our systems and services. Our whole existence is about empowerment, so you can obtain the result you want – A successful private house sale!